Billing & Statements allows you to access to your previous statements and see upcoming billing. 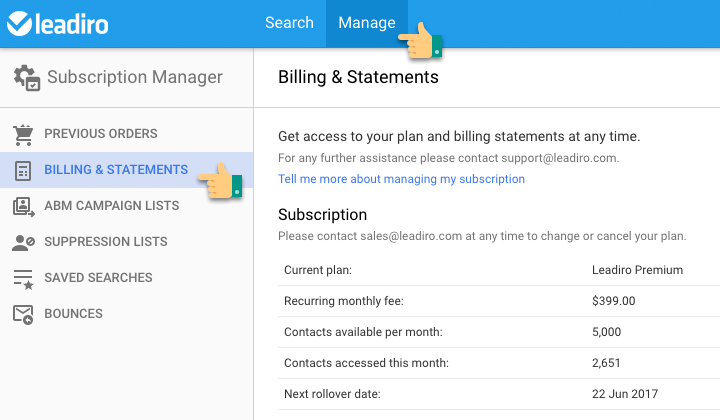 NOTE: Billing & Statements are a Subscription feature - if you have an Enterprise account you won't see this feature. Information on your current subscription is available in the Subscription section. This details your current plan, monthly fee and other important facts about your plan. You can access all of your previous statements in the Available statements section. They are permanently available and are never removed. Clicking on the link will download a pdf file. This is also a legal invoice that can be used for tax purposes.